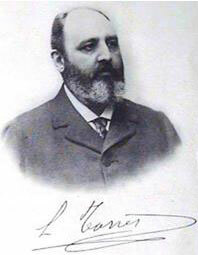 In 1893 Leonardo Torres y Quevedo (see biography of Leonardo Torres) presented his first paper to the Spanish Royal Academy of Sciences. It was devoted to an algebraic machine, able to calculate the roots of an any-grade equation. The paper was accompanied by a working prototype of the device (see the lower image). That was the first automatic calculator, designed by Torres y Quevedo in a long list of them (he designed many advanced machines, inlcuding first practical chess playng machine). Quevedo’s major motivation in all his work in the field of automatic machines (besides calculating machines and chess automations, he built also an automatic weighting machine and a machine for playing a game, similar to Nim) appears to have been to exploit, to the full, the new facilities that electromechanical techniques offered, and to challenge accepted thinking as to the limitations of machines, but not to create a workable general-purpose electromechanical computer, or some else great. Torres certainly had the knowledge and potential to manufacture such a machine, but it was too early, the need for large scale fully-automatic calculating machines appeared as late as 1940s. Torres’ major written work on the subject of automatics was his fascinating Essays on Automatics, published in 1913, in which he devised the term Automatics. The paper provides us with the main link between Torres and Babbage. Torres gives a brief history of Babbage’s efforts at constructing a mechanical Difference Engine and Analytical Engine. He describes the Analytical Engine as exemplifying his theories as to the potential power of machines, and takes the problem of designing such an engine as a challenge to his skills as an inventor of electromechanical devices. The paper in fact contains a complete design (albeit one that Torres regarded as theoretical rather than practical) for a machine capable of calculating completely automatically the value of the formula α=ax(y–z)2, for a sequence of sets of values of the variables involved (see the lower drawing). It demonstrates cunning electromechanical gadgets (switches, electromagnets...) for storing decimal digits, for performing arithmetic operations using built-in function tables, and for comparing the values of two quantities. 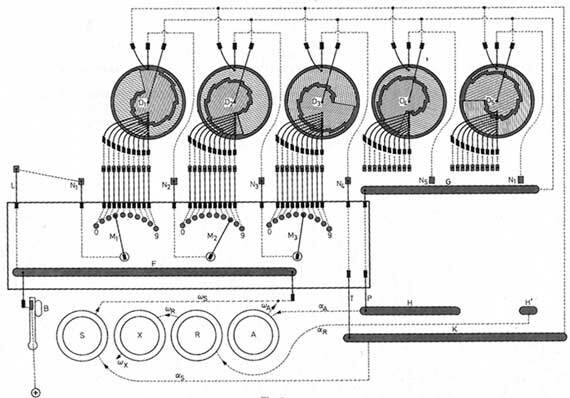 The whole machine was to be controlled from a read-only program (complete with provisions for conditional branching), represented by a pattern of conducting areas mounted around the surface of a rotating drum. Incidentally, the paper also contains, almost casually, what is believed to be the first proposal of the idea of floating-point arithmetic! Later on Torres created a series of working prototypes of the above-mentioned machine. Possibly the first was a demonstration machine, capable of evaluating p x q–b (see the lower photo). How successful this was in practice we do not know. In 1920 Torres must have removed any uncertainty about his potential and knowledge to built a workable electromechanical calculating machine, because he startled the attendees at a Paris conference, marking the centenary of the invention of the first really practical calculating machine of Thomas Colmar, with a demonstration of his electromechanical arithmometer (see the lower photo). This machine consisted of an arithmetic unit connected to a (possibly remote) typewriter, on which commands could be typed and the results printed automatically. 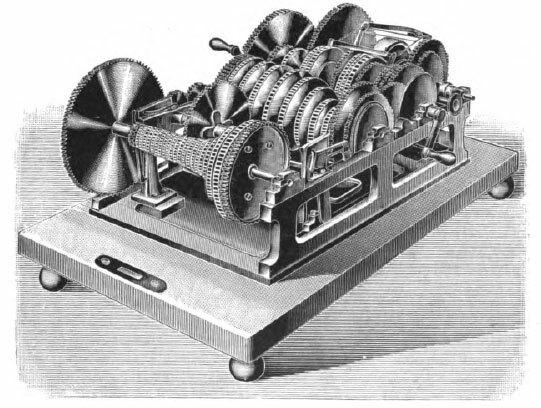 Torres apparently had no thought of making such a machine commercially, viewing it instead as a means of demonstrating his ideas and techniques. In order to use the system, the operator types at the typewriter, in the usual manner, the statement of the operation, which he wishes to have executed. Thus if he wants to multiply 532 by 257, he presses successively on the keys representing the digits 5, 3, 2, then on the space bar, on the key representing the multiplication sign, again on the space bar, and finally on the keys for the digits 2, 5, 7: the machine thus types the statement 532x257. That's all! When the calculation is finished, the machine commands the typewriter which prints, after the data typed by the calculator, an equals sign and the result of the operation. Finally, the typewriter advances a line and the carriage is brought back to the left ready to print and execute a new operation. 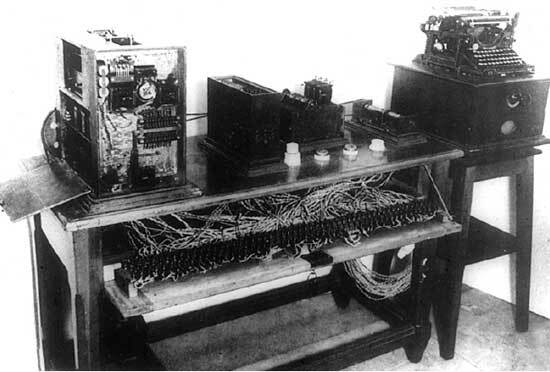 The calculating machine and the typewriter are connected by an electric cable, so by using a long cable they can be separated in big distance. According to Torres the method of performing division is a main characteristic of my machine. It compares automatically the divisor and the remainder and then if the divisor is smaller, subtracts it from the dividend; otherwise, it divides it by 10, displacing the carriage by one place to the right. The five drums D1, D2, D3, D4 and D5 represent the dividend. The three cranks M1, M2 and M3 represent the divisor. The three pointers Q1, Q2 and Q3 represent the quotient. The operation of the machine is not automatically however. In short, the operator knows that he must subtract the divisor (operate the crank S), if it is smaller than the remainder or move the carriage (operate the crank A), if it is larger; he will compare the two numbers after each operation to decide what the next action must be. When the operation is finished, he will press on the button r to return to zero. In the end of the article however, Torres mentioned, that in summary, the automation can take into account all the circumstances which one wishes in order to decide the maneuver to be done and it can have the means to manipulate the control levers. I therefore believe that we have grounds to say that we can automate any arbitrary mechanical operation.